A logical game of lovable losers! Get a Sneak Peek at Some of Our Favorites! Our creative team has been poring over a list of 300 animals, trying to determine which ones would best fit in our game. The decisions seemed almost impossible. There are so many amazing animals in our world! Our final goal was to cut the list down to the 60 animals that worked best with the mechanics of our game. We literally spent months researching each animal, talking about their unique traits and behaviors, assigning personalities and archetypes, developing backstories and relationship matrices, etc. After all that work we were finally able to identify the animals in Nobody’s Favorites, and we would like to share with you the six animals that will be making an appearance in our prequel! 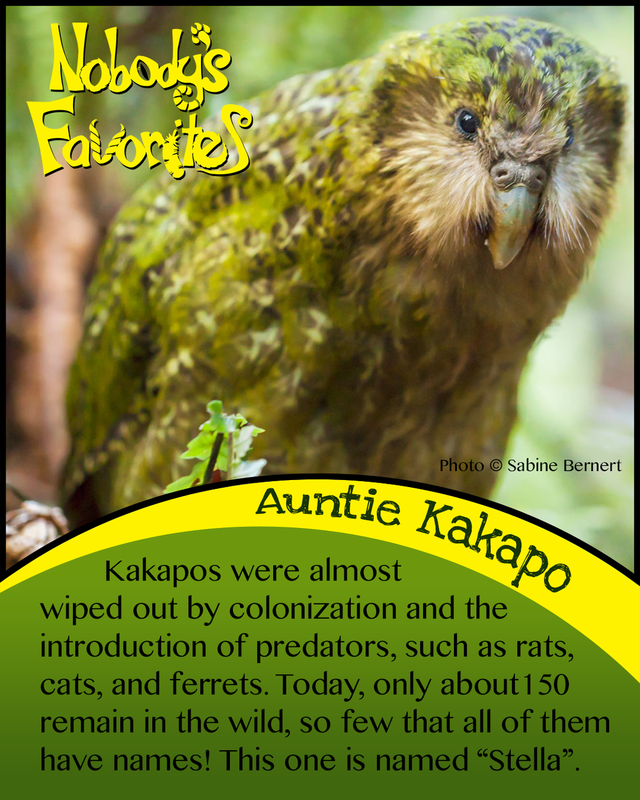 The kakapo was one of the first animals we researched. 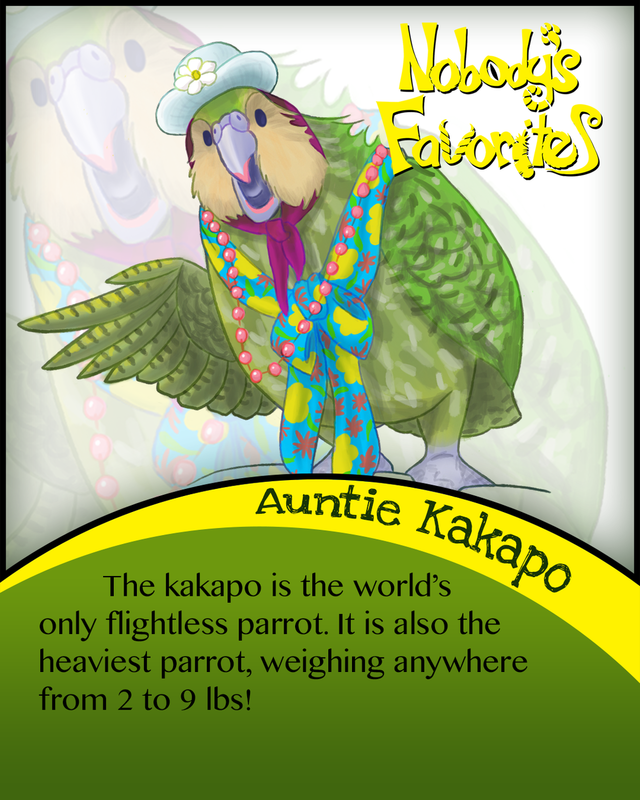 Adding the quirky bird into our game was a no-brainer! We quickly fell in love with its curious, affectionate disposition and adorable awkwardness. We were heartbroken to see that so few were left in the wild. The kakapo nearly became extinct in New Zealand due to colonization and the introduction of new predators to the oceanic islands where they live. Having adapted to evade their natural avian predators, the kakapo were ill-equipped to survive the influx of new mammalian predators. Since the 1970s, heavy conservation efforts such as the Kākāpō Recovery have been established to manage and grow the kakapo population on protected, predator-free islands. You can get engaged with this cause by donating to help the Kākāpō Recovery and staying up to date on the progress of conservation programs. Looking to keep tabs on the kakapo? Follow these social media accounts! - Sirocco: Official Spokesbird for Conservation! We also want to give a big hug and thank you to Sabine Bernert, who gave us permission to use her beautiful picture of Stella the Kakapo. Thanks Sabine! Nobody on our team had even heard of the perentie before we started doing research for Nobody's Favorites, but once we learned about this impressive monitor lizard we had to have him in our game! It was just too interesting to pass up. Did you know perenties lay their eggs inside termite nests? Like other monitor lizards, they have venom glands, which give them a very painful bite - a chomp from these scaly blokes will cause rapid swelling, disruption of blood clotting, shooting pain, and other symptoms known to last for several hours! 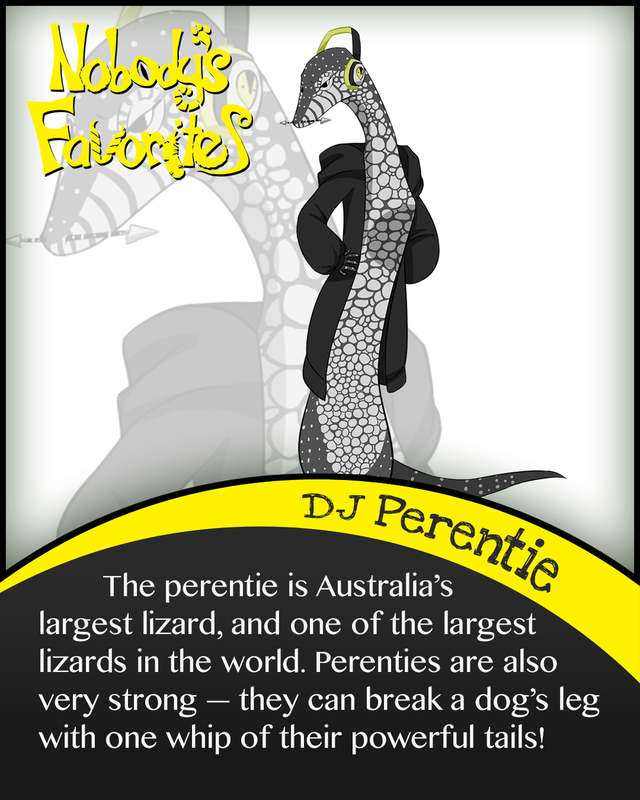 Our DJ Perentie is shaping up to be one of our more complex characters in the game and a favorite amongst our creative team. Luckily, there are not any known threats to the perentie at present and it has not yet been assessed by the IUCN, but in some parts of its range it is under protection. The species is also listed on Appendix II of the Convention on International Trade in Endangered Species, meaning that any international trade of the perentie should be carefully controlled and monitored. To find out more about conservation efforts in Australia, check out these organizations! Like the kakapo, the emperor tamarin was one of the first animals we researched for Nobody's Favorites. Their unique appearance and anecdotal name made them a perfect fit for the game. We're glad these adorable little guys are still swinging around in the canopies of the Amazon rainforests! 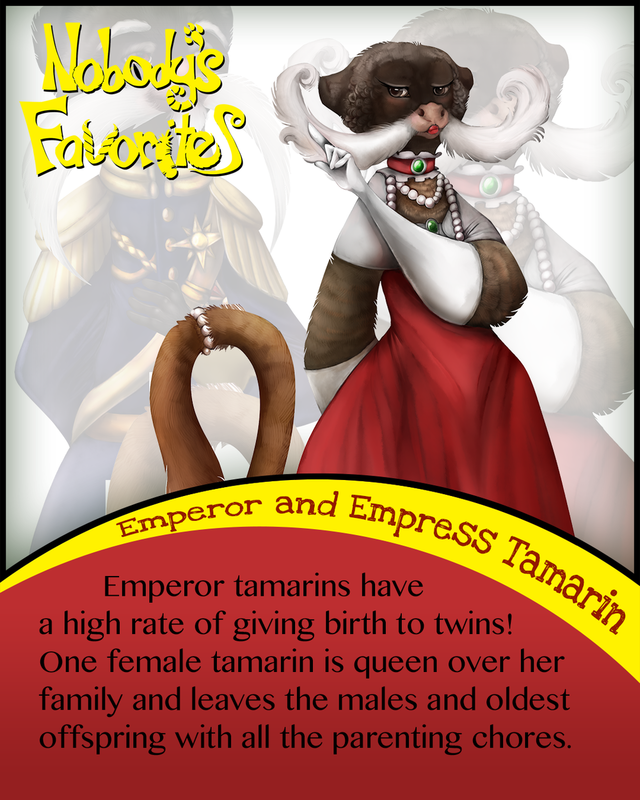 Emperor tamarins are classified as Least Concern by the IUCN, but they are still considered endangered or threatened in Brazil and Peru. Their populations are declining because of deforestation due to the construction of major roads, logging, and increasing human colonization. They are protected in some areas of South America such as the Manu National Park in Peru and the Manuripí Heath Nature Reserve in Bolivia. The species is also included in a European Endangered Species Programme (EEP), which facilitates captive breeding in the case that should it ever become extinct in the wild, there will be some left in captivity that can ensure the species lives on and may once again be reintroduced into the wild. The Durrell Wildlife Conservation Trust is one such organization that is looking out for tamarins and contributing to the salvation of other animal species like them. You can help this cause by donating so that Durrell can continue its work. To keep up to date, you can also follow this organization on social media! When we were first considering the markhor, it was the impressive horns and stately appearance that drew us to the conclusion that he would work well for our game. Since then, he has become quite the integral character! 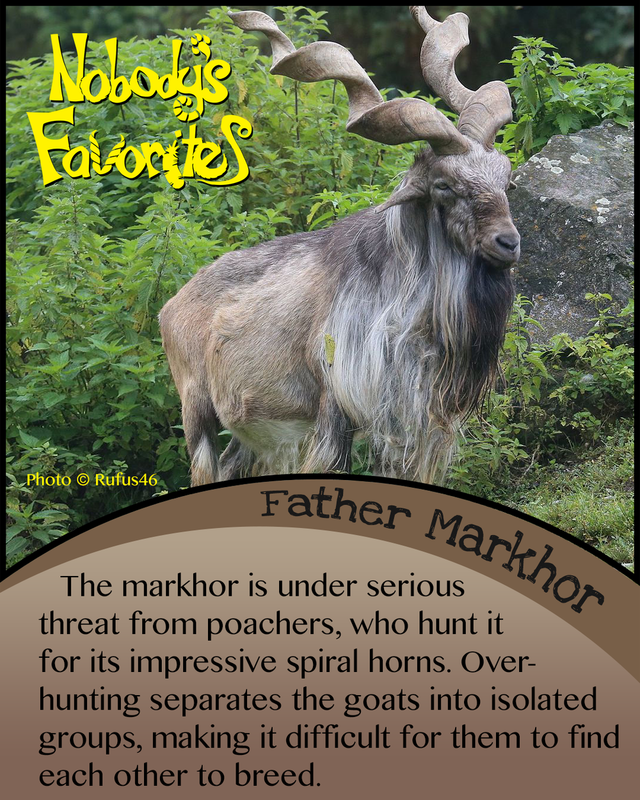 We hope that the markhor will continue to roam the mountains and cliffs it calls home for many years to come. The markhor was classified as both Vulnerable and Endangered up until 2015, when it was down listed to Near Threatened. The biggest threat to the markhor continues to be poachers, but it was also threatened by habitat encroachment by camps of armed forces, excessive livestock grazing, logging, and large-scale development such as roads and mining. In 1984, a critical population of markhor in the Torghar Hills of Pakistan stood at only 200 individuals due to heavy artillery use and poaching in periods of political unrest. The population's recovery, believe it or not, was actually successful due to a community-controlled conservation program that used limited trophy hunting to raise funds for markhor conservation. Today, the same population numbers in excess of 3,500! Overall, in areas with strict control of poaching the markhor population is beginning to stabilize and increase, but subpopulations are still small and very fragmented. To find out more about markhor conservation efforts, check out these organizations! WWF-Pakistan branch: Spreads awareness and knowledge of the markhor. Conservation Force: Spearheads development of markhor conservation strategies. WCS Pakistan: Works to stop illegal hunting and logging, and is instituting a new management structure of community-managed conservancies. Mohamed bin Zayed Species Conservation Fund: Works on conserving the flare-horned markhor by conducting wildlife surveys and monitoring markhors, hiring and training local wildlife rangers, and laying groundwork to establish permanent community-based monitoring programs. 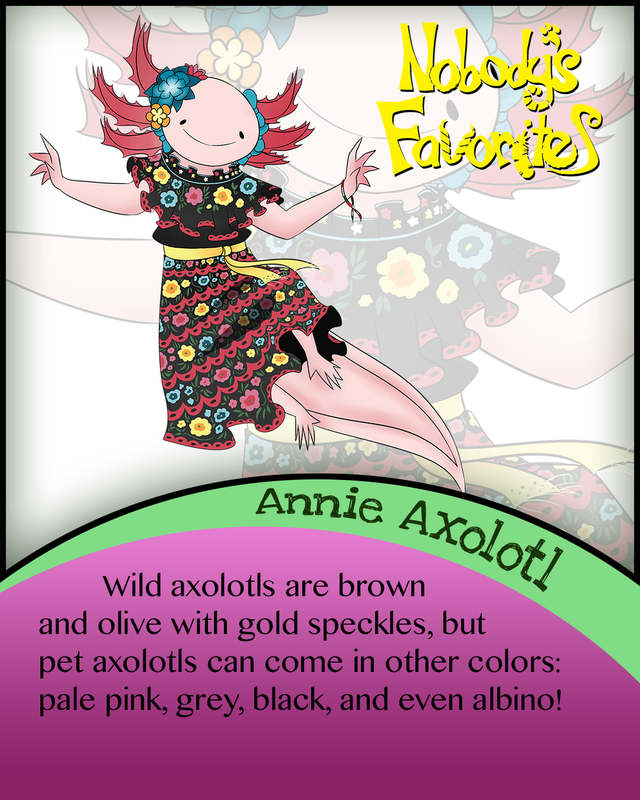 The adorable axolotl has been a favorite amongst our team from the beginning! The way it defies the basic characteristic of salamander biology and remains in its aquatic larval form for the entirety of its life made the axolotl a great choice for our cast of animal misfits. We're disheartened to hear that axolotls are most likely extinct in the wild. Though axolotls are still surviving in captivity, the species is classified as Critically Endangered because of its decreasing populations in the wild. Their major threat to survival is the pollution and degradation of the canal system and lakes they call home as a result of urbanization. Axolotls are also captured for consumption by locals and for medicinal purposes. Because recent scientific surveys revealed no axolotls, they are thought to be extinct in the wild. However, wild-caught specimens are still found in local markets, so there is some hope they're still out there. A study concluded that a small reduction in egg and larvae survival rate would increase the calculated probability of the axolotl's extinction within the next 20-50 years to 100%. Keeping this from happening will not be easy - to save the axolotl, the best option would be to restore their habitat to a state that would be more conducive to the survival of their eggs and young. Scientists are working with locals to bring back the tradition of chinampa farming in hopes of re-establishing the axolotl's habitat in Lake Xochimilco. Chinampa farming is an organic technique of farming on structures that are constructed of aquatic vegetation and logs, interwoven with mud from the bottom of the lake. These chinampas are essentially floating islands which create a good habitat for the axolotls and help filter water for Mexico City. Want to learn more about conservation efforts? Check out this organization!